It is big, it elicits thoughts of pollution, danger, deadlock and adventure! It is….Ciudad de Mexico (Mexico City). At one time the city may of have been blanketed in smog and acted as the drug cartels “control center”. However, the city has been cleaned up so to speak and the cartels have since moved on to the border towns, recycling programs are in place and just like any major city with people who love and care about their city they make it livable and worth a visit. Hey, you know there was a time when you couldn’t go to Times Square in New York without fearing theft of your purse or being hassled by drug peddlers or prostitutes. The city is the epicenter of Mexico’s political, financial, educational and cultural affairs. It is a unique adventure, one that I highly recommend. I made my first trek last weekend and it will not be my last. With a cheap 2 hour flight from Cozumel by Interjet I will be keeping my eye out for more 60% off tickets so I can come back for more! The city has it all; museums, art, music, history (all those Mayan artifacts that have been removed from the archeological sites in Mexico are located here at the Museo Nacional de Antropología), “boroughs” called Colonias, taxis, a 3 peso subway system and of course….FOOD! I am breaking the monotony of this blog post by writing it in four pieces. This is Day 1. We booked our stay through Airbnb, which we highly recommend if you are looking to sleep on the cheap and spend your money by day (i.e. food and maybe a visit to a museum or two). Our hosts were a lovely young couple who met in ahhh the city of love, gran Paris. He is French, from Lyon (totally jealous and I told him that I want to go there for the food sooo badly) and she, gorgeously tall, is from Mexico (Nan, you have legs that could kill, I mean it). And I can’t forget the lovely surprise greeting at the apartment door by their new addition to their home, Maya, the adorable Jack Russel pup. The room we rented (the Elf room) was comfortable and our hosts made us feel immediately at home. After we dropped our bags Pawel and I hit the streets in search of a light bite before a late dinner with our hosts. Our host’s apartment is located in the beautiful, bohemian Colonia Roma. Young and with a flare to the artistic and eclectic, this neighborhood felt a lot like parts of the Village or Brooklyn. The streets are lined with cute cafe’s and their is even a weekend antique fair on Ave. Alvaro Obregon (though we missed out because of the rain). Rainy, late that Thursday afternoon, we didn’t stray too far from the apartment. 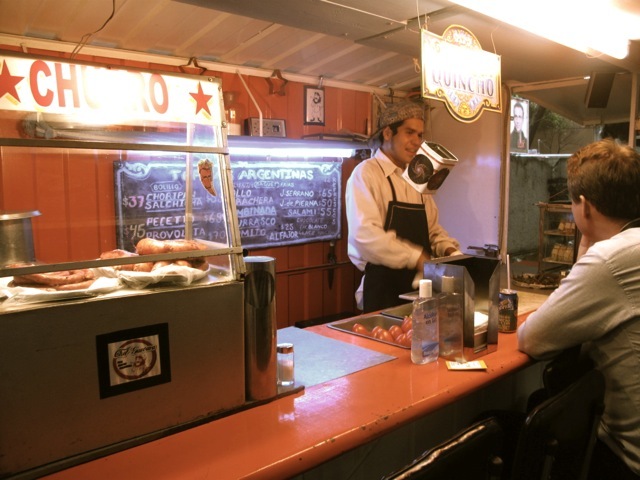 We saddled up to an invitingly warm looking Argentinian Street Truck and indulged in Choripán (come on, you can guess what it is…chori…zo, pán=bread) and a delightfully crisp & cold coke. Following our meal, and still looking to stay dry and warm, we meandered into Cafe Origenes which would become a mainstay during our visit to Mexico City. I cupped my hands around a warm chai tea latte and simply smiled at my husband…and I thought to myself ”we have a lot to eat this weekend”….indeed we did as we had dinner plans with our hosts in just an hour or so later. Glad we dined with them though as we have made new friends.